People familiar with Indian desert Falooda will be in a better position to answer this question. I tried to recreate at home a Falooda that I had outside, ingredients were milk, sabza (Basil seeds), rose syrup, ice-cream and china grass. I purchased all the ingredients, but when I boiled the dried china grass noodles (not the china grass in powder form) in water, all the noodles got dissolved in the water! What is the correct way to make china grass ready for Falooda? Do I soak it in cold water or cold milk? Should the water/milk be warmed a bit? Without boiling, is it safe to consume it? 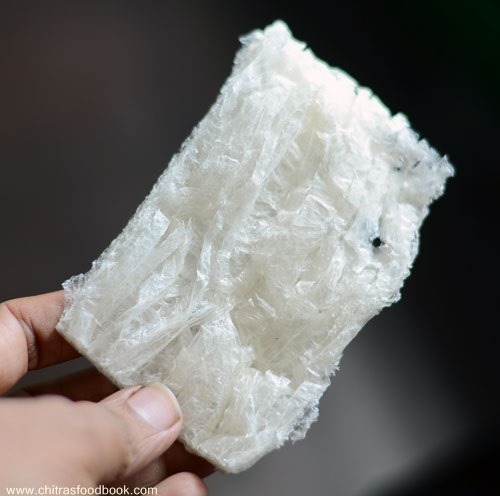 China Grass is also known as Agar Agar, Faluda, Japanese Moss, Ceylon Moss and Bengal Isinglass. It is obtained from various seaweeds, has no aroma and has a neutral taste. It is used to make jellies and, because of it's neutral taste, can be flavoured with any essence. To use China Grass to make jelly, immerse broken strands of China Grass in boiling water to dissolve them. Add Flavouring/Essence and leave to cool and finally set in the refrigerator. Alternatively, place Chine Grass in a pan of milk, bring to the boil (whilst stirring) and strain to remove any lumps. When cool, add flavourings of your choice (try Sugar, Cardamom Powder etc), pour into a dish and refrigerate until set. When ready to serve, cut into fancy shapes using a cooky cutter and decorate with Almonds or Pistachio Nuts. So it seems that it is being used as a thickener for the dessert/drink you are making. While looking at different recipes for Falooda/Faluda, I noticed that many recipes do use China Grass but many that had actual noodles in the dessert used vermicelli for the noodles. So, you may want to try adding vermicelli or another type of noodles to your existing recipe or try another recipe that uses actual noodles. Not the answer you're looking for? Browse other questions tagged indian-cuisine dessert or ask your own question. What is the correct onion to tomato ratio for North Indian masala sauce? What is an easy-to-make dessert that goes well with Indian food? What is the way to make golgappe/pani puri at home? How do you make the shell for this dinosaur egg dessert? Turkish delight is way too soft and too sweet. How can I make it more firm with way less sugar? What way to incorporate sugar into dough for millefeuille is better?